Item number Na812 from the MOA: University of British Columbia. Print depicting a spirit figure with a red humanoid head wearing a headdress with many round-tipped arms that fade from red to orange. The head is flanked by two dark green and brown owls facing outwards that are standing on an elongated dark green and brown form with a lobed edge. 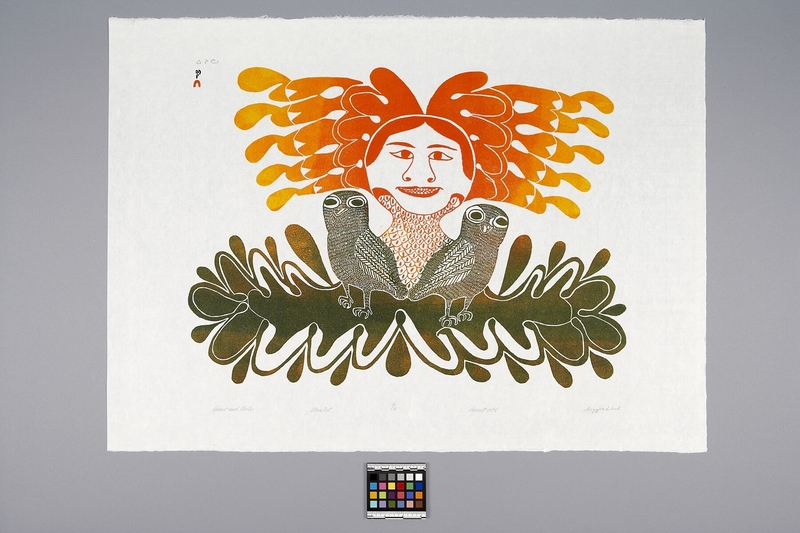 The name of the artist is written in Inuit syllabics above the name of the printmaker, also in Inuit syllabics, which has been printed along with the Cape Dorset Co-operative stylized red igloo seal in the upper left-hand corner of the image. Below the image is written, "Spirit and Owls Stonecut 8/50 Dorset 1975 Eegyvudluk." The Canadian Eskimo Arts Council blind embossed stamp is in the lower right-hand corner.